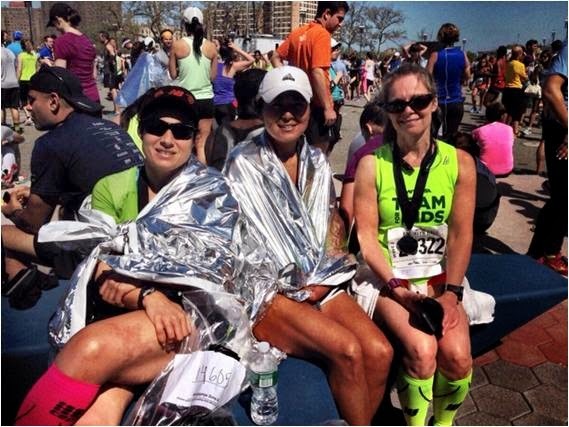 My quads are aching this morning, no doubt due to the pounding that my legs took running down Ocean Parkway yesterday. 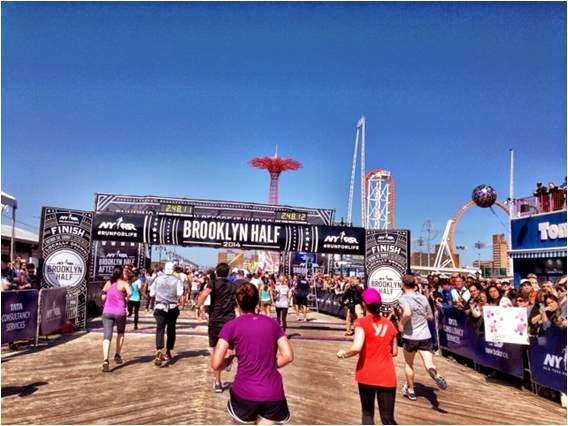 The last five miles felt endless, but the final 200 meters along the Coney Island boardwalk made the experience all worth it. Although my performance wasn't great (2:25), it was in line with expectations. More importantly, it was a great day spent with great friends, each of whom ran excellent races. 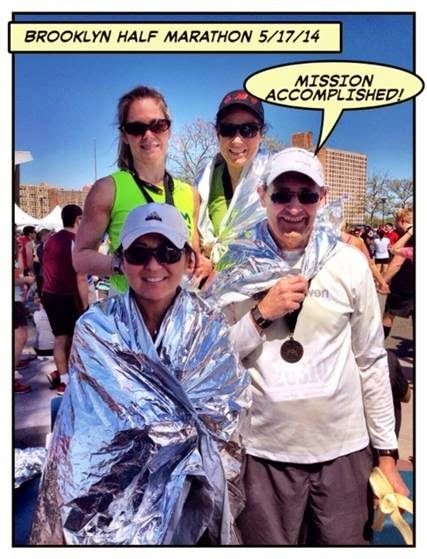 After the horrible attack at the 2013 Boston Marathon, security has been stepped up at most major races. 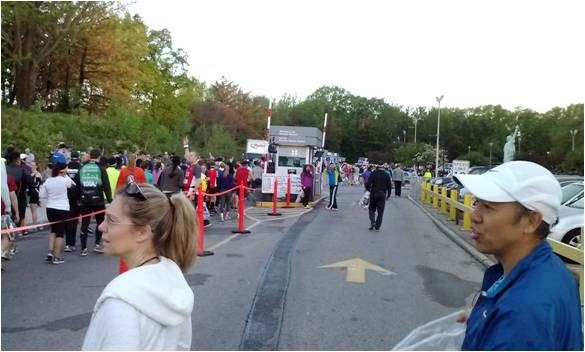 Due to this, race participants were asked to arrive extra early and were restricted in terms of what could be brought to the race. As a result, I only brought things that I could carry on my run or things I could discard. I ended up not "donating" my extra layer that I wore to stay warm before the start. In retrospect, I wish I had (at least) taken it off during the race. My day started very early. I'd set my alarm for 2:35 AM so I could be fully prepared when my friends arrived at my house at 4:20 AM. The plan was for me, TPP and Runska-buddy LS to drive to my friend KWL's house in Queens. 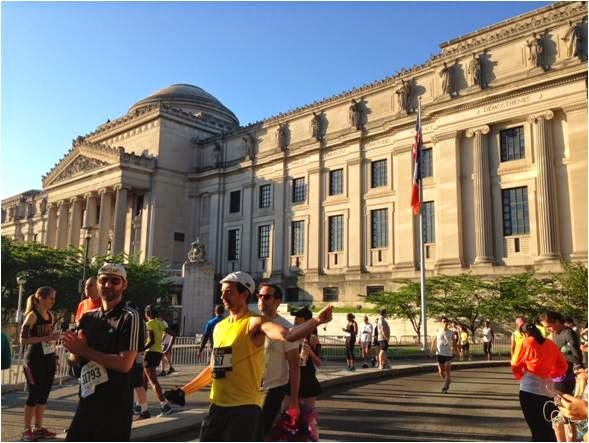 SIOR was to meet us there at 5:00 AM where we would then be driven by a friend to Grand Army Plaza near the race start. It was a tight squeeze in Mark's SUV, but that all went according to plan. 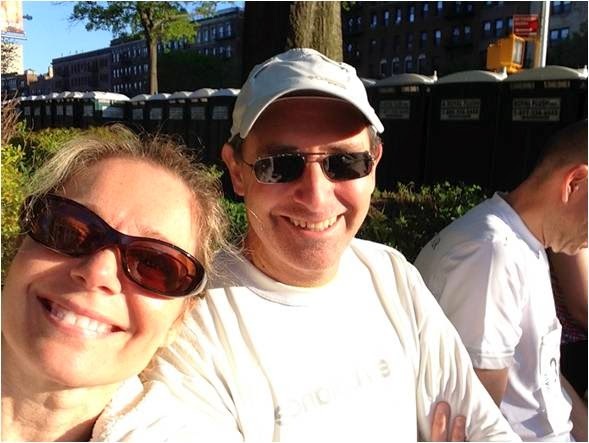 After going through security, we walked along Eastern Parkway, past the Wave 2 corrals and made our way to check out the starting line. We took some pictures and proceeded to the baggage drop off where KWL handed off his bag that contained items belonging to members of our little crew. 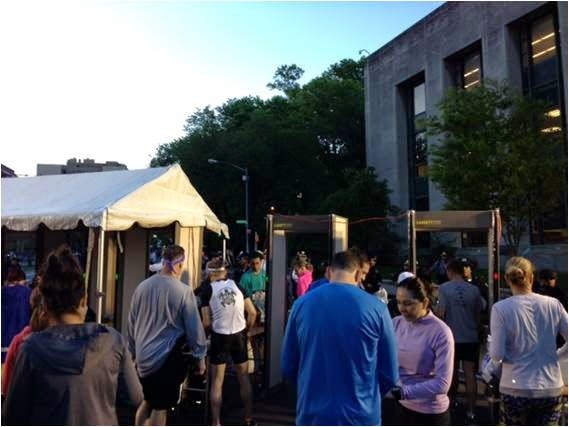 Soon after that, speedsters SIOR and LS headed over to the Wave 1 corrals that started 45 minutes earlier than Wave 2. KWL, also a speedster, was relegated to Wave 2 due to his bib number. TPP and I walked around and tried to stay warm in the chilly, breezy 58° weather. We found a grate in the street that was supplying a little heat and stood on it for about 15 minutes. We were soon joined by other runners who had the same idea. We decided to head to an area that's adjacent to the Brooklyn Museum that had direct sunlight. We hoped that would keep us warm. KWL eventually came by, and we hung out a bit before going into our very crowded corral pen. People were very friendly and I enjoyed talking to other runners as we prepared for the start. TPP and I were in the 6th corral of the second wave. 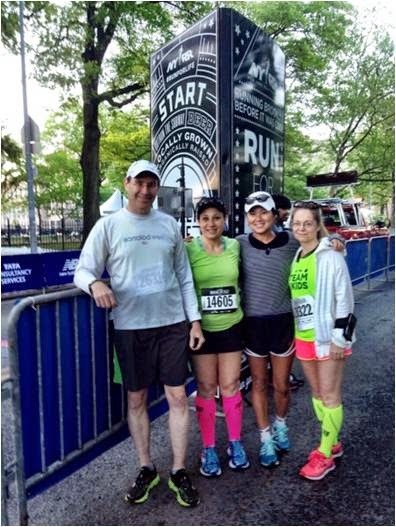 We made our way to the starting line and began running once we crossed over the mat. Off we went! As I made my way down Washington Ave. with TPP at my side, I thought, "This is it. I'm running Brooklyn!" 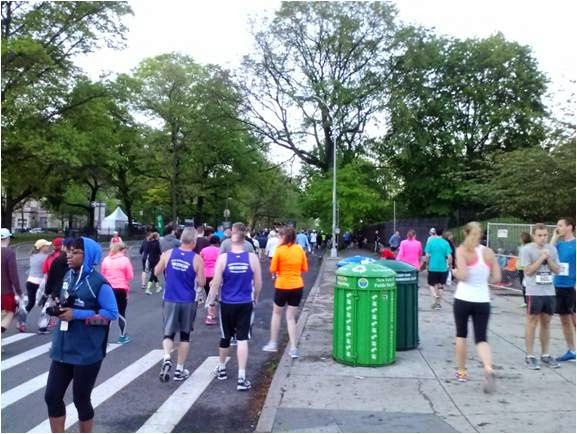 I adopted a brisk but sustainable pace and moved well for the first couple of miles that wended around the Botanical Garden and Grand Army Plaza. Prospect Park was designed by Frederick Law Olmsted and Calvert Vaux who also designed Central Park. It's beautiful, though hilly, but much more manageable than some of CP's challenges. I had hopes of finishing around 2:10 and was on track to do that through my first three miles. 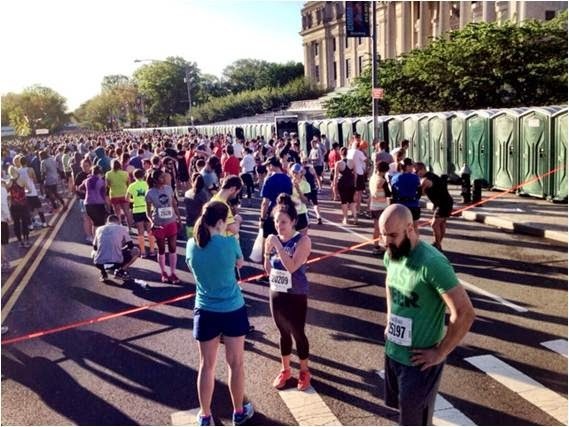 I thought that the seven miles in and around Prospect Park would be the toughest part of the race, but the final five miles really took a toll. I was discouraged to see my split times increasing after the fifth mile and by 10K, my overall pace had increased by 30 seconds. I felt okay as I ran, but was unable to generate much speed. Once we came out of the park and headed towards Ocean Parkway, I had hopes of making up some time. The straight run down Ocean is primarily flat, although there was a small climb as we made our way up the ramp and turned left towards the road. The park provided a lot of shade, but Ocean Parkway was lit up by the sun. I kept telling myself to remove my long sleeve top layer that I'd planned to discard. For some reason I didn't. I'm not sure if that would that have made a difference, but had I done it, it probably would have helped. I felt every mile, but never felt overly taxed until the end. I dutifully stopped at the Gatorade and water stations and, although I wasn't making good time, I felt fully in control. A woman who I was chatting with in the corral told me how the cross streets along Ocean Parkway are in alphabetical order. Watching the letters change gave me a sense of progress. 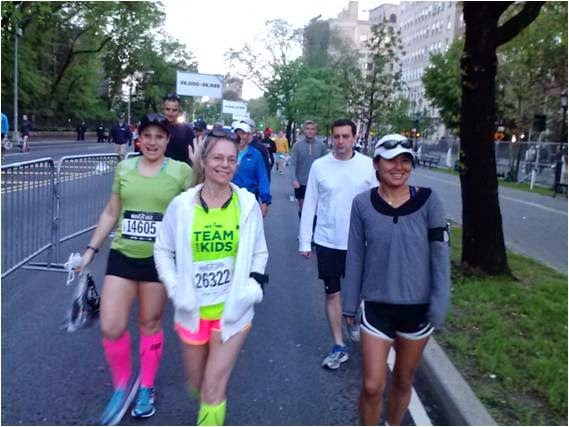 In my two previous half marathons, ten miles is where I began to really feel the effort. Once again that was the case. I locked into a sustainable pace and tried to hold on for the final 5K. I could see the Belt Parkway overpass in the far distance and I focused on that. Soon after, I saw the 20K sign and did the math in my head that I only had half a mile to go. We turned onto Surf Avenue where the roaring crowd of spectators provided a huge wall of sound. I spotted the Cyclone and the sign saying 800 meters to go, beginning the longest half mile of the race. We turned left toward the boardwalk and I saw the 400 meter sign. I was so ready to finish. When I saw the chute in the distance, I gave it everything I had. I crossed the line and collected my medal, feeling completely drained. I downed a cup of Gatorade and grabbed a banana and made my way through the crowd. KWL found me and I sat down feeling overwhelmed. As in previous long runs and races, I felt a little light headed. KWL got me a space blanket and TPP gave me her cup of water. LS got me more water and I took a GU gel to try to get more electrolytes into my system. I was still light-headed even after taking fluids and electrolytes. My friends decided that I should visit the medical tent and I walked over with SIOR, TPP, LS and KWL. TPP spoke with one of the medical workers who allowed me to bypass the line and brought me right in. They put me on a cot, made me swallow two salt packets, drink Gatorade and eat a banana. The EMT took my blood pressure which was a little low. The doctor said that the pounding my legs had taken had pooled blood below my waist and that lying down would help. It was feeling back to normal soon, but they insisted on running an EKG (I guess they had to run these tests due to liability concerns). They eventually retook my pulse which had returned to normal and released me. Once I reunited with my friends we walked over to the street on our way to the F train that would get us back to Queens. We quickly realized that the F train back would take us over an hour, KWL suggested we take a car back to his house. He flagged down a limo, negotiated a great price, and we were soon on our way. After we arrived at KWL's we collected our race bags, gave each other hugs and said our goodbyes. SIOR had driven her own car and headed off to LI while LS and TPP rode back with me. The LIE was like a parking lot, but chatting with LS and TPP made the time go by quickly. We arrived at my house and said our goodbyes. It was only around 1:00 PM, but it already felt like a very long day. Despite my side trip to the medical tent, it was a great experience. I so appreciate the generosity and support of my friends. They happen to be extremely fun and interesting people and that made a good race great. I don't care a bit about my time and finishing when I did was not a great surprise. My race performance has definitely declined over the past two years and I'm planning to get a checkup to make sure everything is on track. Glad it worked out. I hope you call your doc first thing tomorrow morning. Great pictures from TPP and Kin! Another glorious day today! Enjoy with the family! Hope you knock that sore throat out soon, A. :)! I'm enjoying a lazy non-running Sunday for the first time in months. I hope your throat feels better soon. Sunshine cures all ills. What a great write up! You covered everything - and efficiently! I don't even feel like I have to write it up on my blog! (But I will). I had SUCH a great time - I can't wait until we all do it again! I'm so envious! It sounds fantastic! You are all so lucky to have found each other!! Congratulations!!! Somehow I missed this post! Congrats, sounds like a good day, minus the trip to the med tent. I know 2:25 isn't what you'd hoped for, but it's better than I've ever done, and better than what lots and lots of people can do, so don't be hard on yourself. Thanks Di. I really liked the whole experience, even the med tent episode. I've definitely lost speed and would have liked to make my goal time. But I'm proud to have done the race - and I'll keep trying.